Webb Institute of Naval Architecture. 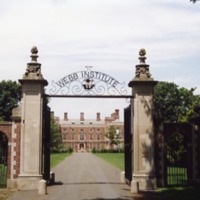 A photograph of the entrance gates of the Webb Institute of Naval Architecture. The school is housed in the old Herbert L. Pratt estate called "The Braes," which was built in 1914.